C4S12CD7 I guess everybody in the western world will be aware of one Sinead O’Connor track and has seen at some point THAT video. If you have been on Mars for 25 years and don’t know what I’m talking about will it’s O’Connor’s version of Prince’s little know track Nothing Compares 2 U, and the video that seemed to be played on a loop on MTV, when as the video draws to a close a single tear snakes its way down O’Connor’s cheek as she finally breaks down singing about a lost love. Urban myth says that this wasn’t planned and just happened whether true or not the video catapulted O’Connor into super stardom and backed by a great album, I Do Not Want What I Haven’t Got O’Connor seemed to be set to rule the music industry for years to come. What we didn’t know was that O’Connor was prone to career suicide, ripping up a picture of the Pope whilst blaming the church for numerous sexual abuse crimes (she wasn’t wrong) on Saturday Night Live (one of the biggest shows in the USA) caused an uproar and left her alienated in the USA. Her next release Am I Not Your Girl a set of classic show tunes lost her more audience. In hindsight she was way ahead of her time in both her accusations against the church and raiding old show tunes but at the time it put her career in free fall. This seems to be a patent that O’Connor has continued to repeat on a regular basis, moments of brilliance mixed with albums of traditional Irish music, dub reggae (with Sly and Robbie) and her last album a double album called Theology and as the title suggested it was full of religion themed tunes. This album deals with all these themes on the one album, reggae, religion, Rasta culture, and Irish music whilst being angry and happy in equal doses and I’m guessing from the lyrics addressing issues from her life past and present. It has an all star cast with contributions from Dave Stewart, Brian Eno, and also the wonderful Skip McDonald, who with his band Little Axe has managed to mix Blues, dub reggae and loops to make a modern musical soup that defies boundaries. After this album as already mentioned O’Connor took each theme and made separate albums exploring each theme, I stuck with her for the traditional Irish tunes album but have dipped out for the reggae and religion based albums. 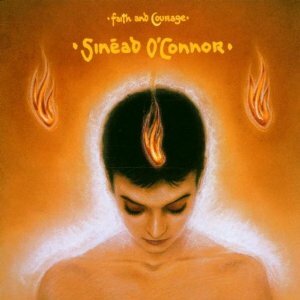 If you lost track of Sinead O’Connor early in her career I would recommend this album all that was good about her early music is hear in abundance. I had forgotten about the Pope pic / child abuse piece.